The international conference Hammer Bioenergietage was held from 12th to 14th of September 2017 in the city of Hamm (Germany). Here different European companies and technological centres presented the last advances and projects in the field of biorefineries and bioenergy. IMECAL was invited by the event organizer to present its PERSEO Bioethanol® technology as well as the international projects in which it is participating, including PERCAL project. In addition to the oral presentation, PERCAL project was also presented with a poster and leaflets during the discussion and poster sessions of the event. The kick-off meeting of PERCAL project “Chemical building blocks from versatile MSW biorefinery” was held last 4th and 5th July 2017 in Valencia (Spain). 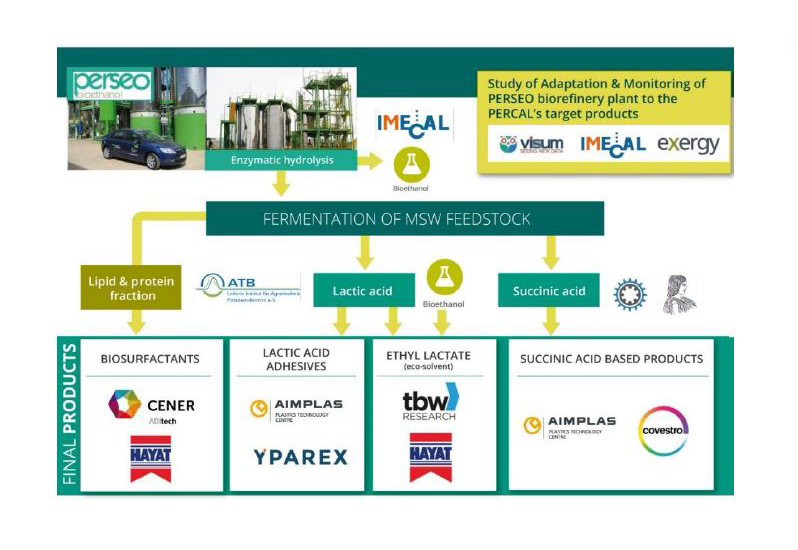 With a budget of 3.4 M€ and 3 years of duration, the objective of PERCAL project is to develop intermediate chemical products with huge industril interest (bioethanol, lactic acid, succinic acid) at high yield and purity from the organic fraction of municipal solid waste (MSW). The international PERCAL consortium is composed of 12 organisations: IMECAL, AIMPLAS and CENER (Spain), Agricultural University of Athens (Greece), ATB Potsdam and Covestro (Germany), Genth University (Belgium), TBW Research (Austria), VISUM (Ireland), Hayat Kimya (Turkey) and Exergy (United Kingdom). The VISUM PALM; a small and convenient portable NIR analyser for fast quality control in the warehouse and in the field. The VISUM IN-LINE is an In-line Near Infrared (NIR) Analyser for continuous monitoring of chemical composition. • Lactic acid (LA) to produce: 1) Eco-friendly ethyl lactate solvents by reactive distillation from lactic acid & bio-ethanol to be used in cleaning products and inks and 2) hot-melt adhesives for cardboard and other non-food applications in combination with maleic anhydride by reactive extrusion. • Succinic acid (SA) as an intermediate building blocks to production of polyols for the polyurethane industry. • Biosurfactants by chemical and/or microbiological modification of protein and lipid fraction from remaining fraction of MSW fermentation. To improve enzymes cocktails to maximize organic hydrolysis for several MSW compositions. To study the production and in-line purification of Succinic Acid (SA) from MSW using membrane electrolysis technology. To produce hot melts based on lactic acid for application in cardboard and labels by reactive extrusion With similar resistance to analog EVA HMA. PERCAL consortium has a well-balanced composition. It brings together a wealth of expertise and resources within the areas, including partners that propose the best solutions to maximize the valorisation of the different components of MSW. The presence of main actors in the whole value chain demonstrates the critical mass of complimentary resources that will enable the PERCAL project to achieve its targeted societal, industrial, and scientific breakthroughs and commercial success. The R&D line of production technology for second generation bioethanol, has developed a biotechnological patented technology for obtaining bioethanol from Organic Municipal Waste. AIMPLAS’ fields of work are related to technological R & D on thermoplastic and thermosetting plastic materials & products, its transformation processes and their recyclability and sustainability. The Institute’s mission is to develop sustainable and highly innovative technologies for the resource efficient utilization of biological systems to produce food, raw materials and energy. The principal research strategy at CMET aims at understanding phenomena of microbial ecology in order to manage the vast metabolic capabilities of complex microbial communities to solve practical problems. The National Renewable Energy Centre (CENER) is a technology centre specialised in applied research, and the development and promotion of renewable energies. It is highly rated and has acknowledged national and international prestige. TBWR`s focus is on applied research only especially in cooperation with industry partners. Thematic fields of R&D activities are in general mobility, energy & renewables, construction and water management. The Compound Company is headquartered in Enschede, the Netherlands, next to its main production facilities, warehouses and quality lab. The Compound Company has 2 product brands: Yparex® and EcoForte®. Yparex® is a product range of extrudable adhesive resins and EcoForte® is a product range of customized thermoplastic compounds. Covestro is a world-leading supplier of high-performance polymer materials for key industries. Business activities are focused on the manufacture of high-tech polymer materials and the development of innovative solutions for products used in many areas of daily life. We are unique in our ability to offer vertically integrated skills in a range of sustainable energy technologies. Exergy can be involved at every stage: from project design and development, through planning and financing, engineering and construction to operation.